The Phillies will kick off their home schedule on Monday when they host a familiar division rival, the newly named Miami Marlins, in the opener of a three-game set. 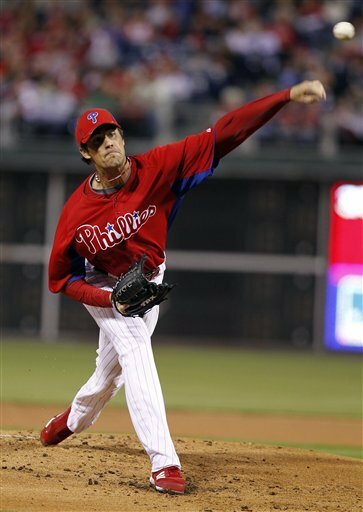 Led by lefty Cole Hamels, who will start on Monday afternoon, the Phillies will try to get back to the winning ways that brought their organization five straight division championships, after losing their last two contests in disappointing, walk-off fashion to Pittsburgh over the weekend. Hamels, who posted a 2.93 ERA in 7 spring training outings, begins a crucial season, with not only the Phillies' run of division dominance on the line, but perhaps his entire future on it too, as the 2008 World Series Most Valuable Player will have the opportunity to sign a hefty contract sometime in the next 10 months, or so. With a sluggish offense thus far in 2012, averaging 2 runs per contest, the Phillies have depended on their starting pitching to keep them in games. In the first three games the season, Philadelphia starters have sported a 0.90 ERA. In the series opener, the Marlins will counter with right-hander Anibal Sanchez, who has struggled against the Phillies in his career with a 3-8 record and a 5.09 ERA in 16 starts. Monday, 1:05 PM. Anibal Sanchez (8-9, 3.67 ERA in 2011) vs. Cole Hamels (14-9, 2.79 ERA in 2011). In 10 career starts at Citizen Bank Park, Sanchez has posted a 1-6 record with a 6.58 ERA. Sanchez went 0-1 with a 3.41 ERA in 5 starts against the Phillies last season. Placido Polanco is 9-for-18 (.500 avg) with a double, a triple and 2 HR against Sanchez in his career. In 15 regular season home starts last year, Hamels went 7-6 with a 2.64 ERA and a .209 batting average against. In 19 career starts against the Marlins, Hamels has posted a 6-7 record with a 3.44 ERA. Chris Coghlan is 7-for-17 (.412 avg) with 2 HR in his career against Hamels. Wednesday, 7:05 PM. Josh Johnson (0-1, 4.50 ERA in 1 start this season) vs. Roy Halladay (1-0, 0.00 ERA in 1 start this season). In 14 career games (12 starts) against Philadelphia, Johnson has a 5-3 record with a 3.16 ERA. Pete Orr is 6-for-15 (.400 avg) in his career against Johnson. The Marlins' ace is 4-0 with a 1.87 ERA in 6 career outings at Citizens Bank Park. In 10 career starts against the Marlins, Halladay is 4-3 with a 2.51 ERA. Halladay has a 20-8 record and a 2.31 ERA in 34 regular season games at Citizens Bank Park. In 3 starts against the Marlins last year, Halladay had a 0-1 record with a 3.00 ERA. Giancarlo "Mike" Stanton and Logan Morrison are a combined 2-for-23 (.087 avg) in their careers against Halladay. Thursday, 7:05 PM. Mark Buehrle (0-1, 3.00 ERA in 1 start this season) vs. Joe Blanton (0-1, 13.50 ERA in 1 relief appearance this season). The lefty Buerhrle is 3-0 with a 5.06 ERA in 3 career starts against the Phillies. Polanco is 14-for-35 (.400 avg) in his career against Buehrle. In 9 career starts against the Marlins, Blanton is 6-2 with a 3.33 ERA. As a Phillie in April, Blanton is 0-4 with a 7.65 ERA in 9 games (8 starts). Coghlan is 7-for-14 (.500 avg) in his career against Blanton. Heath Bell has a 1-1 record with 5 saves, 0 blown saves and a 2.93 ERA in 26 career games against the Phillies. Juan Pierre is 7-for-12 (.583 avg) in his career against Bell. In 123 career games against the Phillies, Jose Reyes has a .307 average with 16 homers, 51 RBI and 48 steals. Reyes is a combined 25-for-68 (.368 avg) against Hamels and Halladay. Hanley Ramirez went 2-for-15 (.133 avg) in 5 games at Citizens Bank Park last year. Ramirez is just 2-for-15 in the early going this season. In 16 career games against the Phillies, right-handed reliever Edward Mujica has a 3-0 record with a 1.56 ERA and a .200 batting average against. In 98 career games at Citizens Bank Park, Jim Thome is a .239 hitter with 26 HR and 60 RBI. Thome batted .324 with runners in scoring position last season. Laynce Nix has a career .111 batting average with a .339 OPS in 15 games at Citizens Bank Park. Chad Qualls has atrocious numbers at his new home park- 2-2 record, 14 earned runs and 7 HR allowed in 11 1/3 innings with a .420 batting average against in 13 appearances at Citizens Bank Park. In 34 games at Citizens Bank Park during his career, Hunter Pence has a .318 average with 3 HR and 18 RBI.